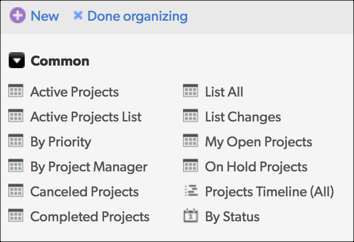 If your app has a lot of reports, you’ll probably want to organize them in ways that are meaningful to your users, rather than in one long list in alphabetical order. For example, you might want to move your most popular reports to the beginning of the list, so your users don’t have to always scroll to them. Or maybe you want to group reports so that, say, all the financial reports are together. To organize reports in an app, first you must be an app administrator. This means that your role in the app must have an Access Level of Full Administration. Your role in the app must also have the Edit Field Properties column checked for each table in which you want to organize reports. These options appear on the Permissions tab when you edit the role. Note: If the app is in an account on the Quick Base Essential plan, only users in the Administrator role can organize reports. In the table bar, click the table featuring the report. Click Reports & Charts to open the reports panel. Click Organize at the top of the panel. You can create groups, and organize your reports directly in the panel by dragging and dropping them. See the other sections in this topic for more details. Note: You cannot organize reports listed under Recent, or personal reports listed under Mine. Organize your reports, then click Done organizing. Click the Organize button on the reports panel. Click a report's name or icon and drag it to a different location in the panel. You can move the report to a different location in the same group, or into another group. A yellow line shows the drop location. Note: If you have many reports, you may want to drag to a location not visible on the screen. To do so, move the cursor to the arrow at either end of the panel to scroll forward or backward. Drop the report (release the mouse button) to finish moving it. Click Done organizing to return to viewing the reports panel. This operation can also be performed with multiple reports. Use Shift-click to select a range of reports, or Control-click to select reports that are in different locations, then drag and drop them in the desired location. Note that any of these actions can be used to select reports in multiple groups. 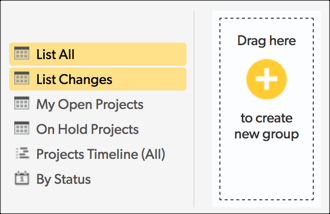 Groups can be rearranged just like reports can, except that only one group at a time can be dragged. When creating a new report, or changing an existing report, you can also use the report builder page to set how it’s listed in the Reports & Charts panel. In the settings for a new or existing report, use the Reports & Charts panel section, then choose Show options. Use the Group for this report setting to select an existing group. See the sections below for information on how to create, delete, and rename a group. Select one or more reports and drag them onto the Drag here to create a new group area on the right side of the reports panel. Group names can contain a maximum of 32 characters. 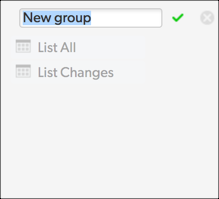 Group names cannot be blank. Groups may not be named Mine, Common, or Recent. When you’re done, click the check icon ( ) or press Enter to save the new name. There are two ways to delete a group: using the delete icon, and removing all the reports from the group. Use the steps below to delete a group via the delete icon. Hover over an item's name, and click the delete icon ( ) that appears. Confirm the action by clicking Delete Group on the dialog that displays. The reports in the group will be put into the Common group after you confirm the deletion. This dialog also gives you the option to permanently delete all of the reports in the group. See the sections below for information on how to create, delete, and modify a report from within the reports panel. Hover the mouse cursor over the report name. Click the report controls arrow ( ), then click the edit icon ( ) that appears. Enter a new name for the report. Click the report controls arrow ( ), then click the delete icon ( ) that appears. Confirm the action by clicking Delete Report on the dialog that displays. Click the report controls arrow ( ), then click the settings icon ( ) that appears.